A few weeks ago, I was invited to join a group of local bloggers for the first meeting of the PDX Book Club. It was fun to have something social just for me to look forward to. We met up at the Starbucks at Pioneer Courthouse Square (that's downtown Portland, if you're not familiar). We sat outside, enjoyed the warm weather, traded war stories about parenthood, and (of course) discussed the book. Afterwards, my husband and I took advantage of the night out. We grabbed dinner from one of the awesome food carts nearby. If you don't know me well, that is my kind of food. Egyptian Food Cart falafel gyro... I already want to go back. So. Good. Anyway, the book. 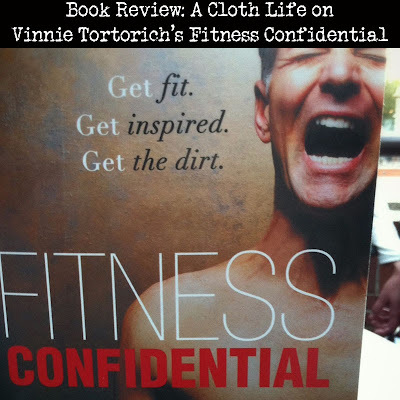 I was sent a digital copy of Fitness Confidential by Vinnie Tortorich and Dean Lorey. If you're curious who Vinnie is - he also carries the title of "America's Angriest Trainer." He's essentially an awesome athlete who is also a gym teacher turned personal trainer, turned celebrity trainer. And Dean Lorey? Ever heard of a little show called Arrested Development? If you haven't, you can catch up on Netflix. My husband has all the episodes memorized. Lorey is a writer and producer for movies and television (AD included, obviously). I was told this would be a memoir, but it's actually a sort of diet book hidden inside a memoir. It seemed like kismet considering I was just finishing up my time with Shaklee, writing about weight loss and fitness. The book is written from Vinnie's perspective. I'll admit, I had a hard time with the book at first. I went back and forth between having respect for him and what he was saying, and thinking he's a total DB. The chauvinism and sexism is plentiful, but further in I realized it was building a foundation for the reader on who he is and how he communicates. His honesty and straight forward attitude gives you a sense that he's being genuine about everything he talks about. And this man holds very little back - from sexual exploits, to fighting back from serious illness, and pretty much everything in between. Vinnie Tortorich is not shy when it comes to calling out some of the ridiculous fitness products and fads on the market as well as the under trained and under-educated staff that most big box gyms seem to employ as trainers. His personality definitely grew on me. I'll be honest here - he's the reason I currently own my own jump rope. Reduce calories to reduce weight. He makes a point, however, of clarifying that the quality of your calories really matters. 1,000 calories from good fats and protein is going to do a lot more for your body than 1,000 calories from sugar/carbs. Be active and exercise for a healthy, fit body. There's a "fitspiration" photo out there of a well toned woman to the side, and the words "Losing weight will make you look good in clothes, exercise will make you look good naked." I think that pretty well sums up that idea. It's common sense, though, right? But if we'd all just do it, we'd all look amazing. Vinnie's advice is to "cut the crap." He strips away all the excuses and makes you realize there's nothing holding you back but yourself. I can't always go running in the mornings because of my young kids, but that doesn't mean I can't do something. The biggest lifestyle change Vinnie pushes is No Sugar, No Grains. The argument is our bodies are better fueled by fat and protein. It's better long term energy compared to carbs that will bloat you and crash you. He's not an extremist, but he recommends you cut it out as much as possible for a healthier, leaner body. One of my favorite quotes is "It doesn't matter what you eat between Christmas and New Years, it only matters what you eat between New Years and Christmas." And if it seems like I've covered everything important in the book, you should know Vinnie has a pretty inspiring story, as it turns out - along with some inspiring stories about some of his clients (which includes Dean Lorey). It's worth the read for any athlete or anyone just hoping to become healthier and more fit. Now, if you've been following this blog for any period of time, you should know that all my reviews are genuine, and I wouldn't promote something I don't personally believe in. So let's up the ante just this once. I know Vinnie is a "celebrity trainer," and Dean is a celebrity in his own right, but I have a great love and respect for self-published authors. Add it to my bucket list that I'd like to count myself among them someday. So I'd like to truly support their endeavor. I was given my copy of Fitness Confidential for the purpose of this review. Now, I will purchase a copy for one of you! Maybe when it's my turn, someone will do something similar for me. To enter, simply fill out the Rafflecopter form below. Standard ACL giveaway rules apply. This contest runs for 2 weeks from start. Open to US residents only. Disclosure: I was given a digital copy of this book along with a Starbucks gift card in return for my participation in this book club. All views and opinions are my own. I am not a medical professional, please consult a physician before making any serious changes in diet or activity.